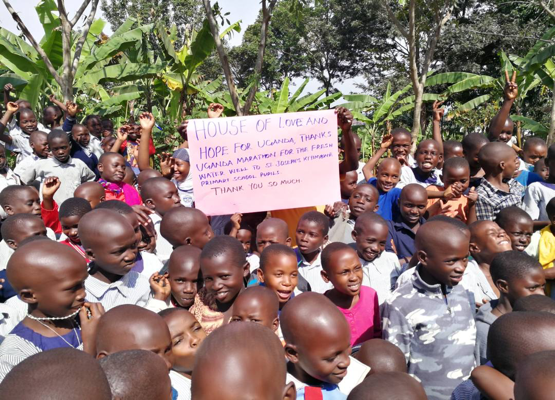 House of Love and Hope for Uganda is situated in Ssaaza, about five minutes from the Athletes’ Village. They work with several schools in the area, some situated right along the marathon course. This organisation works to make sure that no children go hungry at school, by providing free school meals to disadvantaged pupils. As of May 2016, 8 out 10 children who attended school in Ssaaza did not eat school lunches. Malnutrition affects children health, physical development, and their ability to learn. Last year, the marathon runners supported HoLaH by funding a fresh water well at St Joseph Primary School, this has since made water bill savings that have enabled the school to support 15 children with school meals every day. This year, we want to build on this success with more sustainable programs! To feed one pupil for a whole school term costs £6.60. This will provide the pupil with a basic school breakfast of porridge and a lunch of posho (maize flour) and beans. So in order to do this for 95 pupils, year in year out, we need to sustainably raise £634 every three months. One of the most reliable markets and source of income in Masaka is rearing chickens for eggs. This is why House of Love and Hope want to create a poultry farm for 500 strong layers chickens. St Joseph school is going to provide the land, and with your funding we will build a chicken coop, stock it with chickens, and provide feed up to the point of laying. This project is set to generate profits of £212 a month and so will hit our target for as many years as the chicken coop remains active – a long, long time. Through partnerships with other charities, they have managed to give lunches to 254 kids every term. They have managed to give out 200 Uniforms to school pupils. They have managed to buy beds for the St. Joseph School pupils. They organised and administered the fresh water tank for the St. Joseph’s School, funded by 2017 Uganda Marathon runners. Their management of the water tank will give the school an advantage of saving money, as well as generating an income.